With the grand opening of the museum at the Gateway Arch National Park, America’s Birthday Parade and Fair Saint Louis, downtown St. Louis will be the place to be to celebrate Fourth of July. Metro Transit makes it easy to enjoy all the fun and festivities without having to deal with blocked streets, traffic or parking. Grand opening festivities at the Gateway Arch National Park will take place on July 3 with the official ribbon-cutting ceremony at 10 a.m. Following the ribbon cutting, the museum will open to the public. There will also be a celebration in the North Gateway park after the ceremony with food trucks, games, live music and more. America’s Birthday Parade will take place in downtown St. Louis on July 4. The parade will begin at the intersection of 20th and Market Streets at 9:30 a.m. and proceed east on Market Street and end on Market and Broadway. The Union Station, Civic Center, Stadium and 8th & Pine MetroLink Stations are all just a couple of blocks away from the parade route. Please note that the elevator at the Union Station MetroLink Station is out of service while undergoing a complete rehabilitation, so families using strollers and those who cannot navigate stairs or steps should get off the train at the Civic Center Transit Center. MetroLink will operate on a Sunday schedule on July 4, and will operate extra trains after 5 p.m.
MetroBus is another great option. Ride on any of the 18 MetroBus routes to the Civic Center Transit Center and walk a couple of blocks north to the parade route. Some MetroBus routes will experience detours due to the closure of Market Street for the parade, so allow a little more time for your commutes that morning. MetroBus routes will operate on a Sunday schedule on July 4. MetroLink will operate on a Sunday schedule on July 4, on a regular weekday schedule on July 6, and on a Saturday schedule on July 7. Extra trains will be put into service each evening on those dates to accommodate Fair Saint Louis attendees. MetroLink Operations will monitor platforms throughout Fair Saint Louis for overcrowding and will add extra service, as needed. MetroBus will operate on a Sunday schedule on July 4, on a regular weekday schedule on July 6, and on a Saturday schedule on July 7. 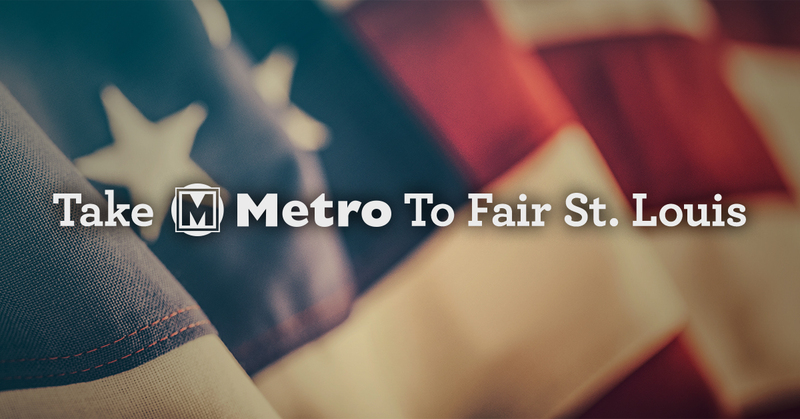 Metro employees and ticket agents will be at select MetroLink stations along the system to assist fairgoers all three days. For only $5 – the cost of two one-ride tickets – you can enjoy a round-trip ride to Fair Saint Louis on MetroLink. 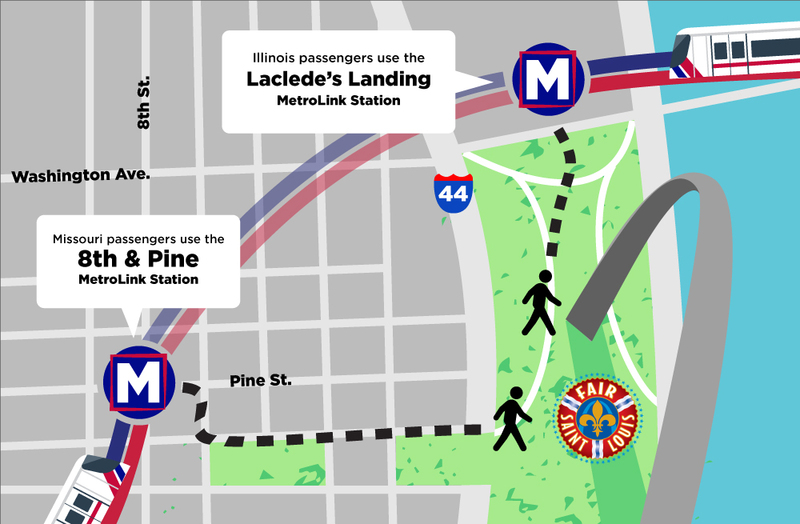 We encourage you to purchase two one-ride tickets while you are on your way to Fair Saint Louis, so you will already have your return ticket in hand when you are ready to leave and can avoid delays and waiting in line to purchase a ticket. A one-ride MetroBus fare is $2 and $3 for a 2-Hour Pass/Transfer. To plan your trip on Metro to the grand opening festivities at the Gateway Arch National Park, America’s Birthday Parade or Fair Saint Louis, download the Metro On The Go app, use the Trip Planner or contact Metro Transit Information at 314-231-2345 or 618-271-2345, from 7 a.m. to 6 p.m. Monday through Friday. The Metro Transit Information phone lines will be closed on July 4. I guess Convention Center Station will be best for the insiders to board at. What happened to the buses that used to service the crowds in the past? It was a lot more convenient when the buses were right there at the designated stops waiting to take you home right after the fireworks, then having to stand in the long Metrolink lines and still have to wait on trains to arrive at the stations. Metro stopped doing this special service as ridership declined, even when it was downtown. When Fair Saint Louis was in Forest Park, the only added service was on the northbound #90 Hampton. We are going to a friend’s home who live in Gentry’s Landing. Can we bring coolers with adult beverages on the train? We will just be transporting them – not drinking them on the train! Alcohol is not permitted on Metro vehicles.